The most recent federal government shutdown ended after a record 35 days, but recent research suggests that the mental health impact on affected workers may extend for weeks after. For one thing, workers’ financial worries may not be easily mitigated. That, combined with a backlog of work upon returning to the office, can put a strain on mental health and decrease productivity. Kojo speaks with experts on how local offices can improve resiliency and how previously-furloughed workers can manage stress. KOJO NNAMDIWelcome back. How has the shutdown impacted your mental health, your sense of self-worth? The longest government shutdown in American history is over, but experts say the mental health side effects of being out of work for 35 days, some without pay, has taken its toll. Joining me in studio to discuss this is Meredith McKeen. She's the Director of the Multicultural Center and Youth Initiatives at Northern Virginia Family Service. Meredith McKeen, thank you for joining us. MEREDITH MCKEENThank you for having me. NNAMDIAlso with us is David Ballard. He is the Assistant Executive Director for Organizational Excellence at the American Psychological Association. David Ballard, thank you for joining us. DAVID BALLARDThanks for having me. NNAMDIDavid, lengthy federal shutdowns have become more common in recent years. What does recent data tell us about the mental health impact this has on furloughed employees? BALLARDWell, this is certainly an important topic right now that affects a lot of workers all across the United States. And there was actually a study released last year that provides some important information about this, because people tend to think that the shutdown ends, people go back to work, and everything goes back to normal. And what we found out is that's not necessarily the case. BALLARDIn the study that came out last year, it actually looked at the effect on workers following the 2013 government shutdown, so it directly relates. Now, that shutdown was only a couple weeks, so this is actually even longer. But what they found is the negative effects on worker wellbeing, on their job performance, carried over for more than a month after they actually came back to work. BALLARDSo, they were having more work/life conflict, less life satisfaction and job satisfaction, higher levels of burnout, all things that have implications for their health and wellbeing, but also for the performance of the agencies and the organization itself. NNAMDIWell, other people are used to financial setbacks, but why is being furloughed within the federal government such a unique stressor? BALLARDYeah, this is an interesting one because there are obviously the financial implications. And people are still digging out from that, you know, if they’re waiting on a paycheck, if they're trying to catch up on bills. So, there's still those lingering financial hardships, but they're also coming back to a mountain of work that built up over the course of an entire month and pressing deadlines, and all of that is coupled with uncertainty about what's yet to come. BALLARDThere may be another shutdown in just over two more weeks. So, the stability of their job, they don't know what might be on the horizon. And from the study, we know that, you know, one of the mechanisms here is some of the positive things that people get from work. So, feelings of purpose and accomplishment, social connection and support, autonomy and control, you lose those things when you're furloughed and you're out of work. And those are actually resources that help people cope with stress, manage the challenges that they face, and those things don't go away immediately when they return to work. BALLARDSo, you're still feeling those aftereffects, which make the added stress even harder to manage. So, it's sort of a snowball effect. NNAMDIAre those the corresponding mental health symbols that come when steady work is no longer a part of your life? BALLARDThat's certainly related, because when you see things like job instability and layoffs and other unstable work, you see sort of extreme versions of that. But when it's contributing to burnout, it's leading to people feeling exhausted. Their motivation levels are lower. Their job performance slides. They're more negative and cynical and frustrated. And it can actually affect their job performance, because it can cloud your thinking, make decision-making harder. BALLARDAnd so it's not only that it's affecting them and their health, but, you know, their job functioning at the same time can be negatively impacted. NNAMDIOf course, not all furloughed employees experienced the shutdown in the same way. Earlier this week, we talked with federal contractors who were not included in the deal that promised back-pay to workers. Let's revisit what our guest Davon said. He's a security officer at the Smithsonian Museum of Natural History. DAVONIt's been a mess, because, you know, every working person has bills to pay. I have a three-year-old daughter I have to provide for. So, as far as this government shutdown goes, I've definitely been forced to pick and choose which bills I wanted to pay during this government shutdown. So, it's been crazy. 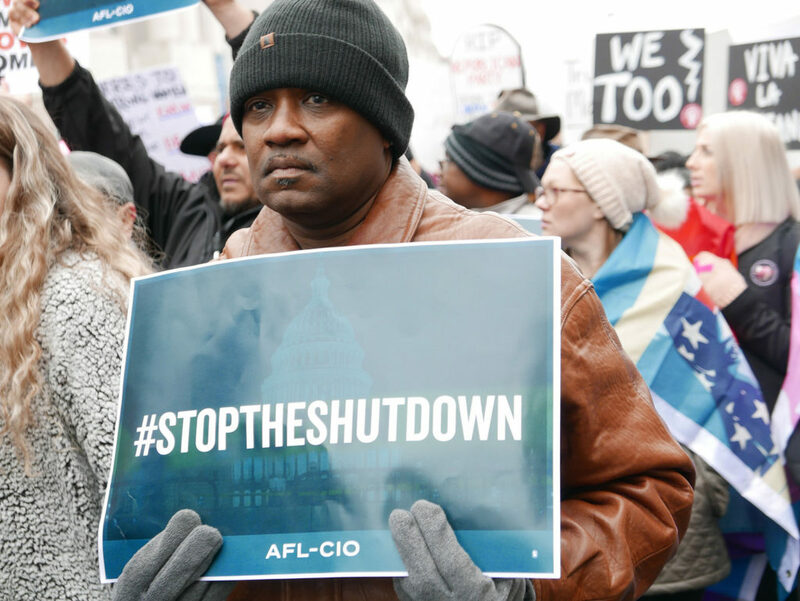 NNAMDIMeredith, throughout the shutdown, it was clear that some Washingtonians think the federal workforce is a somewhat affluent group of people. Can you explain how these assumptions impact those who struggled financially during the shutdown, and how it might impact their own feelings of self-worth? MCKEENAbsolutely. I think you heard from your previous caller great examples of the realities of a number of people who are in our region who are living paycheck-to-paycheck, and who have been affected by the furlough, but who are not, themselves, federal workers. So, anybody who is a contractor, who was not receiving income for the entire period of the shutdown, also people who are in service industries that support the federal workers that then became underutilized. MCKEENSmall businesses were impacted. And we also know that in our community, there are a lot of people who depend on services and systems being in place who were also impacted. So, those who were concerned about safety net services, courts being open, and, for example, their income tax returns being filed and addressed on time. MCKEENSo, anybody who is living precariously financially is greatly impacted by any sort of change in income, and that is extreme sometimes in our community, because of the cost of living. But it also can impact the way that people feel eligible for seeking help or who -- how people may decide whether they have a right to seek help if the way that a crisis is being covered is being talked about in terms of a particular population, but we know that is actually affecting people on a larger scale. MCKEENAnd I think one of the most profound impacts we've been seeing -- aside from the financial piece -- is a little bit of what you heard from the caller, this idea of just not feeling competent, not feeling good at something that they used to be very good at, so used to being a very good employee, a very competent supervisor or a very effective parent, someone who is good at taking care of their children. This shutdown has affected a large group of people's abilities to manage things that normally they know how to manage. NNAMDIHere is Peter in Washington, DC. Peter, you're on the air. Go ahead, please. PETEROne of the things, Kojo, that I hear is talked about very little is the total loss of income by contractors, as compared to the federal employees who are going to get their back income, though delayed. So, any time the federal government is shut down, there are a lot of contractors living on the edge and not so much living on the edge who are going to lose that income and never see it again. So, it's going to impact not only their financial condition, but it's going to impact their mental stability when they lose that income for 35 days, or whatever. NNAMDIWell, the guest you heard from that we had on earlier this week, Davon, is a contractor. Meredith, what does it mean for workers like Davon, the kind of workers that Peter is referring to who may feel that many federal workers still have it better than them, because at least they're getting paid for the month lost of work? MCKEENYeah. I think any time there's a crisis in a community that affects people differently, there can be a sense of maybe unfairness, or just a sense of needing to prove that you deserve assistance, that you're in need of assistance. And I think again our contractors and anybody who did not receive income for the more than a month of the shutdown is going to be not only financially impacted for a long time, as the caller said, but it takes a long time to recover financially, even if they're back to work. And that's assuming that contractors are back to work or service providers are back to work. MCKEENBut even once people are back to work and receiving income, they still have all of the unpaid debts, things that have accumulated. And I think it's important, and I'm glad that we're covering that and making it clear to people that people have been affected greatly, especially those who have not had a steady source of income. And, again, this is often a group of people who normally do, so in other circumstances are not used to facing that kind of financial stress, financial challenge, and are often people who need to do extra work to figure out where to go for assistance. NNAMDIWhat questions can federal employees ask themselves, David, to gauge their state of mental health? How can people be more active in taking control of their wellness? BALLARDI think looking at the bigger picture is really important. Obviously, as people are coming back, it's the challenge of catching up on work and getting back up to speed. But we also need to think bigger picture about how do we prepare for the future and the uncertainty that lies there. And that means creating a work environment that is going to support employees. It's going to provide a healthy climate so that people can actually function at their best, and so that they can weather the kinds of storms that might still be on the horizon. BALLARDSo, I think from an employee perspective, one, looking at how you take care of yourself and managing stress, so making sure that despite these challenges in coming back to work and getting caught up, still making time to disengage from work appropriately. Have times when you're not working and not thinking about work, engaging in activities that are relaxing for you, non-work activities, hobbies and interests that are interesting and challenging, getting enough sleep and taking care of yourself that way, and keeping enough social support. BALLARDSo, I think taking an honest look about how you manage that so that you can be at your best to cope with it, but then thinking about the work environment, too, in terms of those resources I mentioned earlier. So, your sense of autonomy and control and supportive supervisory relationship, how can you build those things now to not only help you cope with the current challenges, but so the next time something hits, you're better equipped, you've planned for it and you've got those supports that can help you cope with it a little bit better. NNAMDIHere's Maggie in Washington, DC. Maggie, you're on the air. Go ahead, please. MAGGIEThanks, Kojo. So, I run an organization or a business, actually, called #NatSecGirlSquad, and we offer programming and community building for people that are committed to competent diversity in national security and defense. Most of our members are women, and immediately at the start of the shutdown, we started receiving requests for financial assistance and were able to give out just under $4,500 over the course of the shutdown, in addition to running a whole additional, you know, kind of programming, resume reviews, recruiter meet-and-greets. And it was my hope -- I guess naively so -- that when the shutdown ended, those requests for help would maybe peter off. MAGGIEAnd, unfortunately, what we found is that between Monday and Wednesday of this week, we received an additional 250 inquiries from people needing assistance. So, we now have about $6,500 in unfunded requests for financial assistance, and we're also hearing, of course, from contractors who are not receiving back-pay, but particularly people whose stories are falling through the cracks. MAGGIESo, either they were out on parental leave and scheduled to return during sometime in the shutdown -- so that's income that they are not going to get back. Or they were slated to start a new job. Many people, particularly what we're seeing is the Department of Homeland Security, they were scheduled to start a new job. Their start date was during the shutdown. MAGGIENot only has that start date been pushed back, but those programs are now on hold, and they're not sure whether or not the job they were counting on even exists anymore, and they won't find out until the earliest being the end of March. So, as we continue to try and raise funds for these people, we're also getting a lot of requests for what are some ways that I can take care of myself beyond on the financial. MAGGIESo, we've been doing yoga classes, SoulCycle classes, and really just opportunities for community together time. But as someone not personally affected by the shutdown, I am certainly seeing the long-term implications. NNAMDIOkay, thank you very much for your call, Maggie. And David and Meredith, please hold your thoughts and response to Maggie for a second, because we're going to have to take a short break. When we come back, we'll continue our conversation. Nancy in Greenbelt, Maryland, stay on the line. We will get to your call. I'm Kojo Nnamdi. NNAMDIWelcome back. We're talking about how the mental health of federal workers and contractors were affected by the shutdown. We are talking with Meredith McKeen. She's Director of the Multicultural Center and Youth Initiatives at Northern Virginia Family Service. And David Ballard is the Assistant Executive Director for Organizational Excellence at the American Psychological Association. NNAMDIWe just heard from Maggie, by phone. One of the things that Maggie did not say is that all of the people she is helping are people who are generally not used to asking for help, and I suspect that also has some implications for their mental health, because they are in a position that they're not used to being in. First you, Meredith. MCKEENYes, absolutely. I think we at Northern Virginia Family Service are hearing from people who are reaching out for help for maybe the first time in their lives, and a lot of what we're hearing from people is that that is a really difficult adjustment for them to make. Somebody who sees themselves as not necessarily needing assistance is suddenly having to do that. MCKEENWhat I really do want to make clear, though, is that it is very understandable that people would need extra support during a time like this, so there is absolutely nothing wrong with people asking for support and needing help. Whether that's emotional support, whether that's financial support, it makes sense that people's resources and their sort of normal coping strategies are overwhelmed right now. NNAMDIDavid, what resources should affected employees be asking their employers for? BALLARDWell, I think certainly tapping into an employee assistance program, utilizing a mental health benefit that are part of your health benefits package, those are all important resources that are available from their employers, and tapping that if they're still experiencing negative feelings, being overwhelmed, having it affect their inner personal relationships and job performance or health, tapping those resources is critical. BALLARDThey can get short-term counseling. They can get referral to long-term treatment from a psychologist or other mental health professional to get support if it's affecting them in a negative way in their life. I think the other thing that's important to consider is the reality of this situation is, in the United States, a majority of people don't even have enough financial resources to cover a month's worth of expenses. BALLARDAnd we hit that point with this last shutdown, and some research that was done based on the 2013 shutdown from the National Bureau of Economic Research found that almost two-thirds of federal workers had less than two weeks of expenses available for emergency situations. So, one of the things in preparing people to cope with these uncertainties in the workforce is helping employees anticipate what might happen in the event of a shutdown or a furlough, so that they can plan ahead, accordingly. BALLARDSo, it's one thing to clean up the mess after it happens, but it's another to help people prepare and think about the resources that are available they can tap into when something occurs, so they're better prepared to do so, especially if they're not accustomed to it. NNAMDISpeaking of planning ahead accordingly, here is Nancy in Greenbelt, Maryland. Nancy, you're on the air. Go ahead please. NANCY...who writes a budget thing for Washington Post all the time, and she has very practical advice which I actually took the other day. I wrote down every single penny that I spent for one whole month. And everything, every single dime that went out of my pocket, I wrote down in this notebook and I was shocked at how much money I was spending. NANCYI was really shocked, and I think people are not prepared for how much money they are spending, and they need to really -- they can do yoga and meditation and go to a therapist and, I'm sorry, there is no help. NNAMDII know Michelle Singletary learned frugality at the feet of her sainted grandmother, and has been carrying on writing about it in her column to this day. But I guess this is also a wakeup call for a lot of federal employees in terms of how they, themselves, learn to budget. BALLARDYeah, it absolutely is, and I think all of those resources, whether it's, you know, financial management, training or coaching or counseling in the workplace, which is becoming increasingly common, access to those health and wellbeing resources like the, you know, the fitness center or the yoga class, those are all important resources that are available. But if that's the only thing that's being done, if you put the onus entirely on the individual to cope with what's being thrown at them, then you're really falling short as an employer. BALLARDAnd I think for the government level, for managers and supervisors and leaders, they have a really important role not only in creating that healthy and supportive climate in general, but training supervisors to better understand the effects this kind of thing has on workers, how to point people towards the resources that are available and rebuild trust. Because, basically, trust between employer and employee, the psychological contract that's there has been broken, in this case. And trust is very difficult to rebuild and takes a long time afterwards. NNAMDIWell, Meredith, a lot of popular resources for federal employees like Jose Andre's Chefs for Feds meals program were concentrated in downtown DC, but the majority of federal employees in our region live outside the District. What mental health resources are available in people's neighborhoods, particularly out in Maryland or Virginia? MCKEENSo, I think we are lucky, in some ways, in the DC Metro region to have local jurisdictions that have some robust ways of helping people. So, I would encourage everybody who is not living in an area that is convenient to DC or who are experiencing challenges, contact their local county public service or public assistance bureaus. They'll be called different things, but often, a crisis assistance bureau, or local non-profits. MCKEENNow, some local non-profits may have a range of services, but may not be able to meet all of the needs that people are calling about, but there is a network. And non-profits and counties and cities often partner to provide the network of services. So, I would encourage people -- it's going to be different in every jurisdiction depending where people live, but identify a local non-profit or even your county government's assistance bureau. Make that outreach call and start gathering information. NNAMDIDavid, one of the things we have not had the chance to talk about is how studies show that federal and non-profit workers are at higher risk for burnout. BALLARDWell, it's an interesting concept, because you think when people are going through stress and burnout, I mean, what are the factors that make that more likely? And one of the things we know from the research is that people who are more invested in their jobs, it's more core and central to their identity and who they are as an individual, you know, they're passionate about the causes they're working on. BALLARDThey feel like it's making a difference to the community and to society. When they're faced with the kind of loss of this, it puts them at higher risk of burnout, because it is something they're invested so strongly in, that they'll go above and beyond to do it, because they're doing it as more of a calling. It's not just to put food on the table or to pay the bills. And so, when that's threatened, it's a whole other level of stress that they face. NNAMDIHere now is Harold in Springfield, Virginia. Harold, you're on the air. Go ahead, please. HAROLDThank you, Kojo, for taking my call. Talking about the federal government employees versus contract employees, I experienced a very, very strange thing a couple of years ago when there was the shutdown. From the federal employee point of view, we were contracted, and the contract was written in a really strange way, I guess. I'm not a contract expert. But I had a team of people who had special needs, and our contract had -- about 75 percent of our workforce was special needs people. And when the shutdown took place and the government employees were furloughed, I was asked by my employers, my managers and all, to hide my staff, because it didn't look good that they were working while the federal employees had to go home and weren't getting paid. HAROLDThey just weren't getting paid for that particular timeframe, but they were going to get paid when they came back. And I had to hide my employees for the simple reason that bureaucracy or politics or whatever it was, and it just didn't make sense to me. So, I just wanted to share that, that that's how -- and the federal employees would come and pass, you know, rude comments and be really -- it was ill will towards our team because of the fact that they were not working, but they were going to get paid, which didn't make sense to me. NNAMDIWell, Harold, apparently federal contractors are experiencing hardship in a variety of ways. We're running out of time, but we got an e-mail from Karen, who says: I can't speak for all agencies, but at my office federal contracts are being suspended in several ways as priorities are being reassessed. New contracts have not been approved. Work has not resumed for existing contracts. NNAMDISo, that's the kind of uncertainty and pressure, David, that federal contractors are feeling right now. BALLARDYeah, it's, again, something that was probably not anticipated, that you come back and things are different from where they were before. So, not only are you trying to catch up, but you may not even know what you're trying to catch up on or the status of ongoing projects that you thought you had lined up moving ahead. All of that's totally uncertain, as well. BALLARDAnd it's the same for contractors who, you have the issue of them not getting paid, necessarily, but you also have the fact that they may not even have a job anymore, or the project may be on hold or completely cut. NNAMDIAnd I'm afraid that's all the time we have. David Ballard is the Assistant Executive Director for Organizational Excellence at the American Psychological Association. David, thank you for joining us. NNAMDIMeredith McKeen is the Director of the Multicultural Center and Youth Initiatives at Northern Virginia Family Service. Meredith, thank you for joining us. NNAMDIToday's conversation on mental health of federal workers was produced by Ruth Tam. Our discussion on drunken driving data was produced by Cydney Grannon. Coming up tomorrow on the Politics Hour, DC Councilmember Robert White joins us to discuss the future of education and of sports gambling in the District. NNAMDIWe'll also sit down with Alexandria's new mayor, Justin Wilson, to talk about how that city is preparing for the arrival of Amazon, and a summer of metro station closures. Plus, resident analyst Tom Sherwood and I will dig into Maryland Governor Larry Hogan's State of the State Address. That all starts tomorrow, at noon. Until then, thank you for listening. I'm Kojo Nnamdi.